Ceanothus are not as widely used in Australia as they could be. A reasonably drought tolerant and easy care plant. Ceanothus flower in late winter to spring. 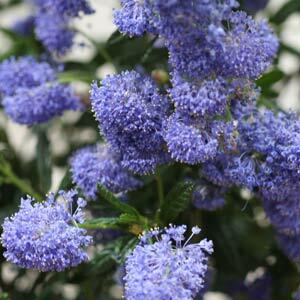 Also known as the Californian Lilac, Ceanothus papiliiosus has attractive blue flowers and good glossy green foliage. Originally from the USA where it thrives in warm summers and cold winters. well suited to growing in many areas of Eastern Australia. A number of cultivars are available, the most notable being C. arboreus ‘Trewithen Blue’ with is wonderful blue flowers which appear early from late winter to early spring. A native to California, Ceanothus ‘Joyce Coulter’ sometimes called ‘Creeping Mountain Lilac’, is a low growing shrubby plant that is relatively drought tolerant once established and with reach 2/3m with a spread of 2m+. Use this variety as a flowering ground cover plant. C. spinosa or ‘Redheart’ has attractive white flowers, bees and butterflies love the flowers. Ceanothus will grow well in a sunny well drained humus rich soil. Best in full sun but will handle part shade as well. Does require good drainage, particularly over summer when little to no extra watering is required. Covered with masses of lilac blue flowers in spring it is also attractive to birds and butterflies.